MILESTONES is a lilting, free-associative masterpiece that follows dozens of characters — including hippies, farmers, immigrants, Native Americans, and political activists — as they try to reconcile their ideals with the realities of American life. In intimate discussions of subjects from communal living to parenting, pregnancy to family, Vietnam to Cuba, city life to country life, and the workplace to the bedroom, the film's diverse protagonists negotiate jealousies, relationships, and the logistical challenges of their rapidly changing world. 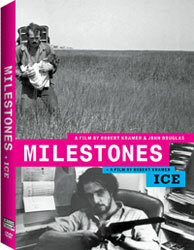 Shot in vivid color 16mm, using innovative, layered sound design and editing techniques as well as slides and archival footage, Milestones tracks its subjects through scripted and unscripted moments. It follows them as they share their emotions and dreams, their idealism and disillusionment, their triumphs and defeats of the past, as well as the possibilities for the future. This DVD is sold for private, home use only. An innovative independent thriller, shot in New York City, which centers on a revolutionary group plotting to attack a fascistic political regime.